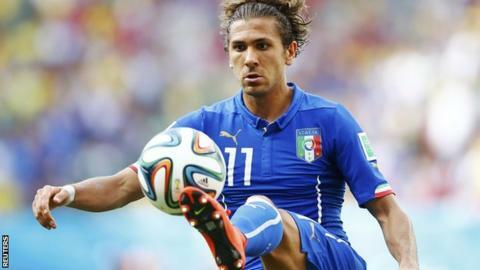 Spanish champions Atletico Madrid have agreed a deal to sign Italy forward Alessio Cerci from Serie A side Torino. The 27-year-old, who had been linked with a move to Arsenal, will sign a three-year contract with Atletico. Cerci has won 13 caps for Italy and was part of their 2014 World Cup squad. "He will contribute speed, goals and he's going to give us more alternatives in our attacking play," said Atletico sporting director Jose Luis Perez Caminero. Cerci has scored 21 goals, and provided 19 assists, for Torino in the last two seasons. His arrival will further strengthen Atletico's attacking options as they look to replace Spain striker Diego Costa, who scored 27 league goals before joining Chelsea earlier this summer.